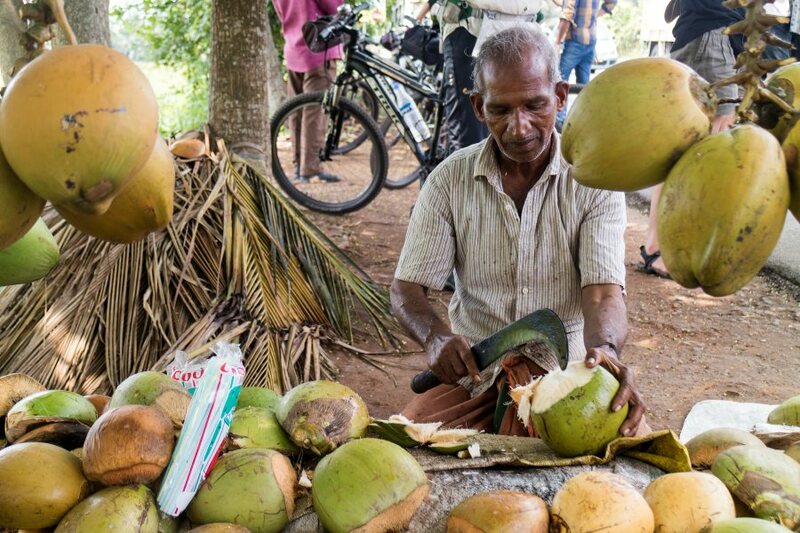 On this cycling tour of southern India we travel into Kerala's rural backwaters. We ride inland through a landscape of spice, tea and rubber plantations. We also travel along the waterways in wooden canoes, walk through Periyar National Park in search of wildlife and relax on Indian Ocean beaches. Staying in family houses we also enjoy warm Keralan hospitality. Arriving in Kovalam today we check in to the hotel. We take this opportunity before our cycling adventure to relax and get a feel for the country. The beautiful beaches of Kovalam are a good place to enjoy a drink from the numerous cafes overlooking the sandy beach. This morning we try out our bikes and make any necessary adjustments. We start with a short and relaxing introductory ride through some of the local fisherman's villages around Kovalam. In the afternoon you may like to explore the area at leisure; walk along the sandy beaches or take on the pounding surf of the Arabian Sea. In the evening you can sit in a beachside cafe, enjoying the vista of fishing boats sailing out for their evening catch with a backdrop of the setting sun. Kerala is particularly renowned for its herbal care, and you may choose to have an Ayurvedic massage. The science of rejuvenation and purification through natural remedies, the massage uses a range of oils and herbs to treat a number of ailments. There is the option to extend your ride today up to 35 kms passing through fishing villages and along a beautiful coastal road. Our total cycling distance today is approximately 12 kilometres (total ascent 205 metres and descent 175 metres). After breakfast we transfer by bus to Veli, from where we cycle 20 km to the estuary. The lagoon is a large lake separated from the ocean by the narrowest of sandbar spits, where fisherman can be seen working on their boats and nets, or poling across the lake with sand-filled barges. We visit the fishing village of Anjuthengu, where we stop to visit Anjengo Fort, built by the British East India Company in the 17th century and the first British trading post on the Malabar coast. After our visit we carry on towards Varkala, a temple town renowned throughout the region as a pilgrimage centre for the millions of Hindus who come here to worship at the ancient Janardhana Swamy Temple. 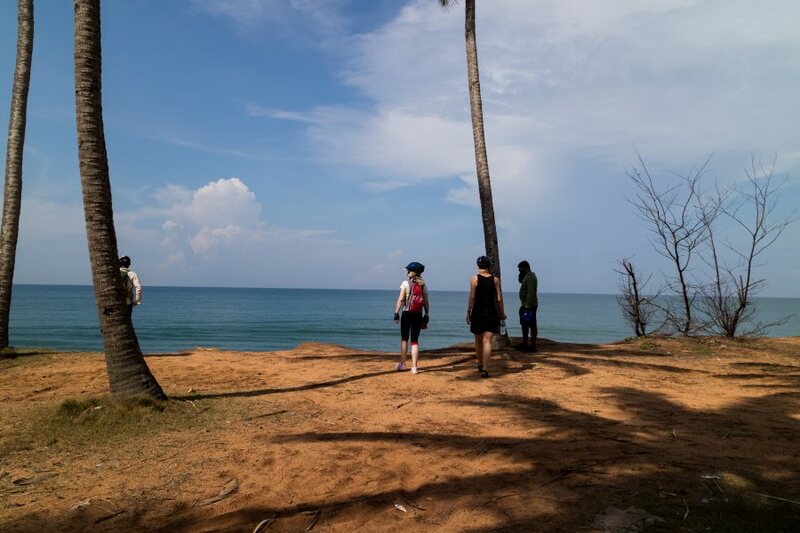 Nowadays Varkala has grown into Kerala's most popular backpacker hangout with people attracted to the naturally beautiful clifftop setting and relaxed vibe. On arrival there should be time to relax on the beaches of the Arabian coast, wander amongst the palms and perhaps enjoy a stunning sunset before sitting down to a well-earned dinner in one of the local restaurants. Our total cycling distance today is approximately 37 kilometres (total ascent 308 metres and descent 285 metres). 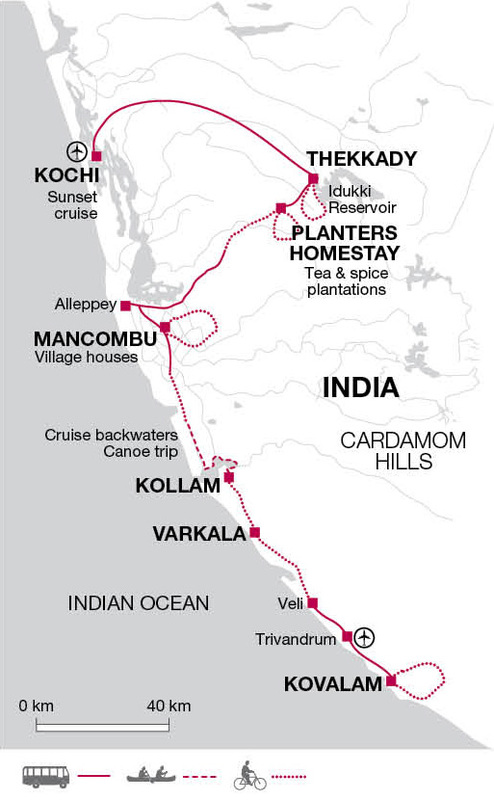 This morning's ride is alongside palm fringed shores and beautiful blue lagoons with the chance to spend a little time on Kollam beach. On the way we can the see fisherman's village which was hit by the Tsunami a few years ago. 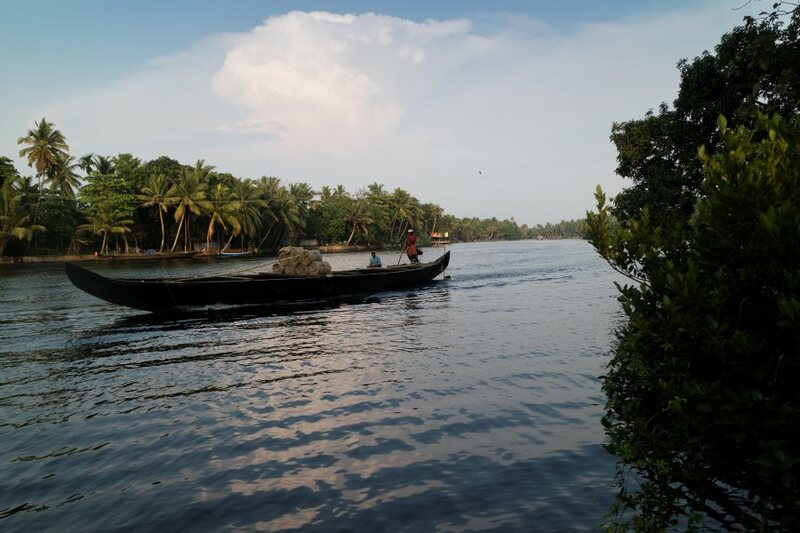 Situated on the edge of the Ashtamundi Lake, Kollam is surrounded by coconut palms and cashew tree plantations, indeed the town is the centre of the cashew industry here. Its old wooden houses are typical of the Keralan style and its situation at the southern end of the backwaters makes it an ideal spot from which to explore the network of canals and lagoons. After a short drive on highway we get back on the bikes and the back roads, cycle further south along coastal roads shaded by palm trees for about 15kms. We cross the river by ferry that acts as a water taxi for the locals with their motorbikes or bicycles. Our ride continues for about 22km which completes today's cycling at the Manarasala Snake Temple, located close to the settlement of Thottapally. On the way, travelling through villages we may have the chance to see some traditional coir-making skills (the fibres from the outer husk of the coconut, which is used to make rope and mats), as well as fishing. After visiting the temple we board in bus again for a short drive to Thotappally where we leave our bus and have a traditional lunch cooked in a family run restaurant and served on a banana leaf. We then spend the afternoon on a relaxing exploration through the backwaters by motor launch that leads us to our homestay. The journey should take around 3 hours and is the ideal way to explore these waterways, which cover an area of some 1900 square kilometres. The boats are the lifeline for the villages, acting as taxis, mail delivery and even the harvest is carried in boats. You may see great pyramids of coconuts or even the odd buffalo being carried along in this time honoured fashion. Our boat trips ends and we proceed to our accommodation, in the district of the ancient trading town of Alleppey. We stay tonight at traditional rural village homes set in lush countryside. Staying with a local family allows us to experience the typical lifestyle and cuisine of Kerala. Most houses have guest rooms within the main home, each with a private guest bathroom. A few homes have a separate guest annexe. The rooms are simply furnished, with twin or double beds. We stay tonight at traditional rural village homes set in lush countryside. Staying with a local family allows us to experience the typical lifestyle and cuisine of Kerala. Most houses have guest rooms within the main home, each with a private guest bathroom. A few homes have a separate guest annexe. The rooms are simply furnished, with twin or double beds. Our total cycling distance today is approximately 39 kilometres (total ascent 295 metres and descent 295 metres). Today we spend the morning exploring our immediate surroundings. Cycling through the villages of these myriad backwaters we get plenty of opportunity to interact with the locals, visit churches and temples, before returning to take a sunset or moonlit cruise by canoe. Crafted out of Anjili wood, we take to the waters whilst locals sing traditional songs as they row. The industrious villagers survive on narrow spits of land, keeping cows, pigs, chickens and cultivating vegetable gardens. Even the shells from the fresh water mussels are burnt to make building lime, and coir is used for just about everything. The gardens are generally well tended often with brightly coloured flowers, such as hibiscus, that contrast sharply with the tropical greenery. Our total cycling distance today is approximately 35 kilometres (total ascent 227 metres and descent 227 metres). Leaving the beautiful backwaters behind we use a combination of engine and pedal power to reach today's destination; Erattupetta. This area is famous for its rubber plantations which date back to the early 19th century. The slightly cooler climate is a welcome change from the lower levels as we cycle along rolling hills in the shade of the rubber trees. We stay with a local family, at their homestay. Watch our host to cook up a traditional curry, walk through the gardens or take a swim in natural rock pools. Planters Homestay is a spacious and comfortable two storey family mansion house, built over 50 years ago. It has bright and airy guest rooms, all en-suite. Some, but not all rooms have air conditioning. The house is surrounded by lush gardens with rubber and tropical fruit trees plus palms and tall teaks and lots of bird life. Our total cycling distance today is approximately 33 kilometres (total ascent 628 metres and descent 636 metres). 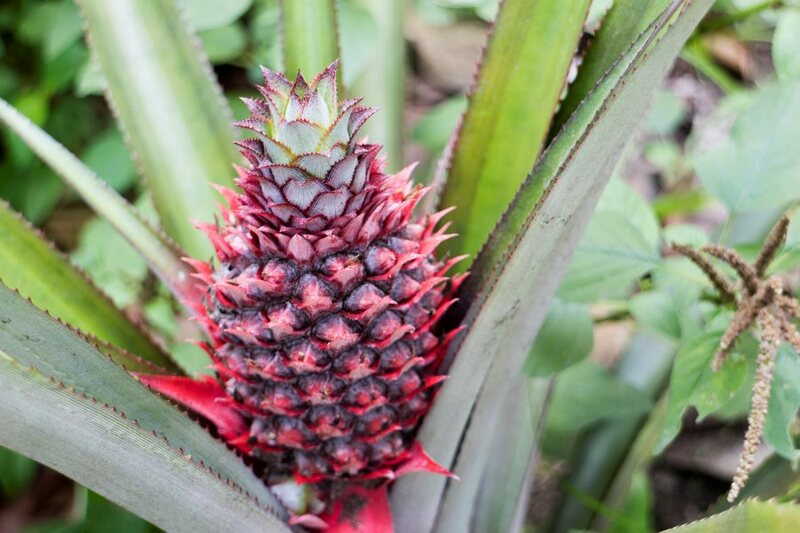 This morning we take a stroll through a local plantation and have the chance to learn about the numerous fruits and medicinal plants. Depending on the season, we may bathe in rock pools before an optional visit to see Poonjar Palace, a 900 year old residency of the Maharajah and his family which is now mostly abandoned and can only be viewed from the outside. We can also visit the local town. Our total cycling distance today is approximately 9 kilometres (total ascent 152 metres and descent 258 metres). There is also the option to cycle 32km if you would like more of a challenge. Taking the meandering roads through the high ranges today we will drive some of the steeper sections of road, before transferring to two wheels to continue our journey to Thekkady. 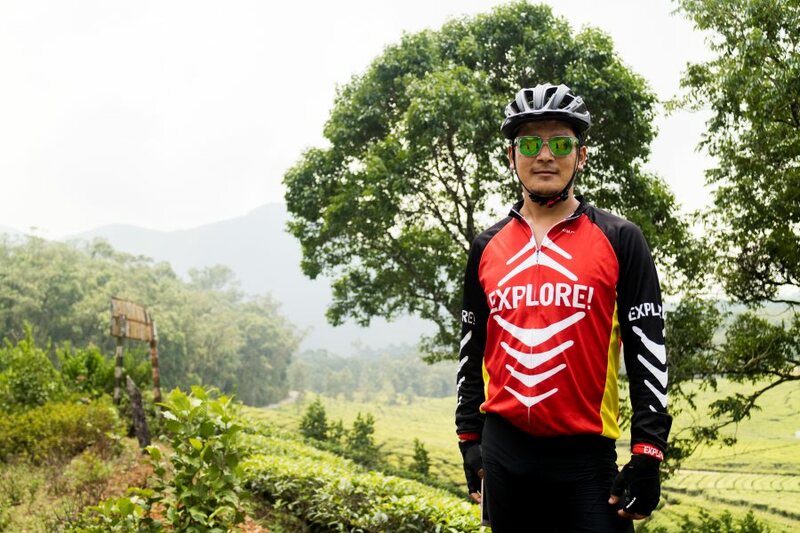 Our cycle route is through a region called Wagamon where the cooler climate helps you through the seemingly endless tea plantations and rolling hills. Our route takes us past many rubber plantations, and through varied spice gardens. Further on, we may have the opportunity to meet local tea pickers in the plantations to help get a feel for how people live in this beautiful region before arriving at our hotel. Please note the last 10km of today's ride is on a busy road. Thekkady is the spice hub of Kerala and the town has many spice shops. The beautiful aroma in the air lets you know why this region is called the cardamom hills. Today we will also make a visit to the Connemara Tea Factory. Our total cycling distance today is approximately 36 kilometres (total ascent 1176 metres and descent 1506 metres). Periyar Wildlife Sanctuary in Thekkady is one of 16 Project Tiger Reserves in India, with about 40 tigers living in the 777 sq km park, but as they are solitary creatures, the chances of seeing them are very slim. This morning we take a forest walk in search of other wildlife such as the star tortoise, porcupine, elephants Indian Bison, flying squirrel and numerous birds. the park itself is made up of a variety of habitats; open grasslands, deciduous, semi-evergreen and tropical forest - all of which host different animal species. The ecosystem of the tropical evergreen jungle is very interesting - the trees grow up to 40m, and the dense canopy above allows in limited sunlight. At ground level, there are abundant ferns, orchids and airplants - plants that need little light to survive. This morning we have a very beautiful route to cycle, down the winding roads of Kuttikanam where you can enjoy a freewheel ride of nearly 20 kms. We continue our journey by bus (3 hours) to the bustling port of Kochi, with its beautiful natural harbor which earned it the title 'Queen of the Arabian Sea'. As well as being the oldest European settlement in India, with its mix of English, Dutch and Portuguese influences, Kochi is also home to the famous Kathakali dancers. Its origins came from traditional temple rituals and from an art form known as Koodiyattam. The dancers can take up to three hours painting their faces - the features are heavily emphasised as it is the facial expressions and co-ordinated eye movements which are important in the dance. The dances usually portray events from the Ramayana and Mahabharata, great Indian epics. Our total cycling distance today is approximately 30 kilometres (total ascent 540 metres and descent 1524 metres). Today we cycle through the old town of Fort Cochin. As you might expect Kochi was founded on trade, originally with the arrival of the Chinese, Arabs and Phoenicians in the second millennium BC. Its links to Europe strengthened in the 16th century, with the arrival of the Portuguese, closely followed by the Dutch and the English. This has produced an eclectic mix of styles and influences. You can find both the oldest European church and the oldest synagogue in India amongst its winding streets and elsewhere Chinese fishing nets vie for space alongside Portuguese houses and Dutch palaces. After spending the day touring the town we take a sunset cruise around the surrounding islands. Our total cycling distance today is approximately 8 kilometres.